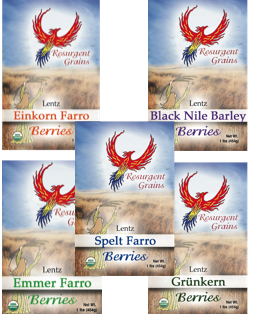 Scroll to see resurgent grains products as Lentz Spelt Farms presents them. But first a few points we should cover, from the farmer perspective because raising ancestral foods amounts to numerous challenges not only in field and barn, but also on the business level – regardless if it’s ancient grain or heirloom veggies or traditional livestock breeds. Yes, we who seek alternatives to industrialized agriculture are all in the same boat. And a small boat it is, a sail boat exposed to founder in the horrendous wake of the globalized system, for which an oil tanker comes to mind. Ironically, Green Revolution is the moniker the military-industrial complex chose for their means to global food supply control, after World War Two. War chemicals reformulated to farm chemicals, and incessant plant breeding, resulted in an immense jump in yields; that third-world hunger was staved off by chemical farming is somewhat true, although poor nations’ diets shifted heavily to carbohydrates in the process, and subsistence farms went under. Stateside, meanwhile, Cheap Food became the hue and cry. No successful revolution ever happened in a country where food costs add up but to a certain low percent of average income, so politicians see Cheap Food as a security issue. Of course, Cheap Food isn’t cheap at all when long-range environmental and human health damages are figured into costs, not to mention all those tax monies spent on enormous agriculture subsidies. For all that, price tags linger in the brain, don’t they. Who doesn’t like a “good” deal? The concept of Fair Price is integral to better-food-supply alternatives. We must face that niche markets have downsides that the mainstream economy doesn’t have. Business risk has to be computed somehow, including weather vagaries every growing season. The bottom line really is astonishment that a resurgence of ancestral foods occurs in America and Europe these days. That the farmer does what the market asks for is a principle the shopper should remember with every purchase, because to purchase, in the big picture, is to summon. With a kitchen mill, berries can be ground coarsely for polenta and couscous; coarsely-ground meal also lends itself to tasty dumplings in soups. Ground fine, the flours can be used in all kinds of baking – see our FLOURS section for advice. Our other flours also contain gluten, albeit in much smaller amounts than Spelt, so they’re best used for dense-texture baked goods such as flatbreads and pizza dough. With a binder (such as Camelina gel, see the Camelina Products section), breads lighter than flatbreads are possible. Pasta is a fun kitchen project; especially our Emmer Flour makes excellent pasta. 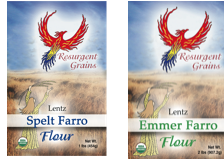 For tortillas try our Einkorn Flour. Pancakes and waffles are breakfast treats for which all our flours are tasty ingredient. Our Black Nile Barley Flour is the pancake favorite. You’re probably familiar with American-style oatmeal. 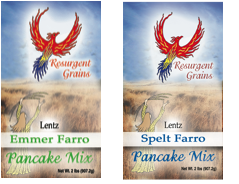 Unlike the soft oats used for oatmeal processing, our Spelt and Emmer are moistened first by steaming at the processor, so they’re soft enough to be rolled; afterwards, the flakes are dehydrated to storable moisture level. Our flakes cook very similar to oatmeal; you will be surprised how much more satisfying they are. Our rolled flakes are a fine substitute for oatmeal in cookies, too. And, our rolled flakes make the best backpacker granola. With minimal ingredients, our pancake mixes can be a quick start into a busy day. Our hulled grains are best planted in the hull, which is why we offer Speltgrass and Emmergrass Seed for folks who grow their own for juicing. The grass will grow back several times after cutting. This seed can also be used to grow Cat Grass – plant a panful and your cat will likely prefer the young grass to your houseplants. Uses for our Lena Camelina parallel that of flax seed and chia seed: Camelina Seed as sprinkle on your salad, or instead of poppy seed on your muffins. Camelina gel is easily made by letting the seed absorb water overnight. The gel then serves as an egg substitute – a fine binder in baking. Our Lena Camelina Oil is best as salad dressing when blended with balsamic vinegar. It’s also a great alternative to butter on your baked potato, and a scrumptious replacement of olive oil on your bread.